As you've probably seen in the news, many of our Nob Hill merchants and neighborhood leaders were frustrated to learn that final ART plans for Nob Hill included wider sidewalks and landscaping improvements for some blocks, but not all. I believe that every business who suffers through construction should share in the improvements, but everyone agreed that no one wanted to extend construction into the holiday shopping season to make that happen. A few weeks ago, I introduced a bill to widen sidewalks, bring back mid-block crossings taken out (including the ones at Amherst between the new Empire Board Game Library and Mariposa) and fund the International District station promised to those residents in community meetings. After initially opposing the sidewalk plan, the Mayor's office agreed to a new plan setting funds aside to work with merchants after major construction ends to evaluate sidewalks block-by-block and funding the new station and bringing back the crosswalks. I'm setting aside $500,000 in local street funds to guarantee our businesses that they'll have resources for that work and the Mayor added $600,000 to fund the new International District station in the compromise. The final bill will be before Council on Monday, April 17th. Thank you to the businesses and neighborhood leaders who asked for help and who worked with us to be sure everyone benefits from this project when it is done! Last year, the city ended it's green parking permit program. Originally meant to encourage green vehicles like a Prius, vehicle emissions standards have improved enough that some new Chevy Tahoe's qualified under rules that hadn't been updated in more than a decade. So instead of letting the program end, I asked our staff to write a new Green Vehicle Permit ordinance updating the standards to incentivize today's greenest cars. My new ordinance passed our Finance Committee last week and will be heard at the Council Meeting later this month. Let me know what you think of bringing back this program and see if your green vehicle qualifies under our improved Green Parking Permit program here. If your vehicle's "Greenhouse Gas Rating" is 9 or more and your vehicle's combines rating is 17 or more, your vehicle qualifies! This week I joined 13 of APD's newest employees at the APD Training Academy to announce our new Property Crime Investigator Program. Last year, Councilor Winter, Sanchez, and I began working with the Mayor's Office to look for a way to tackle property crime in neighborhoods. We took the initial proposal to contract out investigative services short-term and turned it into a full-time program deploying a total of 25 new investigators trained not just to take reports, but to do the CSI and follow up investigations necessary to solve property crimes quickly. The first class of investigatiors started at the academy this week and we'll see them on the street next month. I've gotten a lot of questions about ART funding since President Trump released the outline of his proposed budget reducing funding for Small Starts grants funding projects like ART. Here are the facts: Albuquerque will finish ART construction and we are paying for it with existing federal transportation dollars. The Small Starts grant is set up to reimburse us for those costs. Even if that grant is never funded, we aren't on the hook for unpaid construction costs. Unfortunately, it could mean we wouldn't receive reimbursement that we could put towards future street projects. But as we've seen in recent weeks, the president's proposals is far from a done deal in Congress. I recently traveled to Washington, DC to meet with hundreds of mayors, city councilors and new Trump officials to talk about needs for cities. We're standing united to protect funding for housing, health care and transportation and our Congressional delegation is with us. I've heard loans for Central Ave businesses are delayed. Is that true? Yes. But my office teamed up with other councilors and businesses to get it going. After businesses who had applied asked why they couldn't get a loan, I started asking why the Mayor's office had not completed the program. You might have seen me and other councilors on the news calling for the administration to step up their efforts to fund the loan fund for Central Avenue businesses. 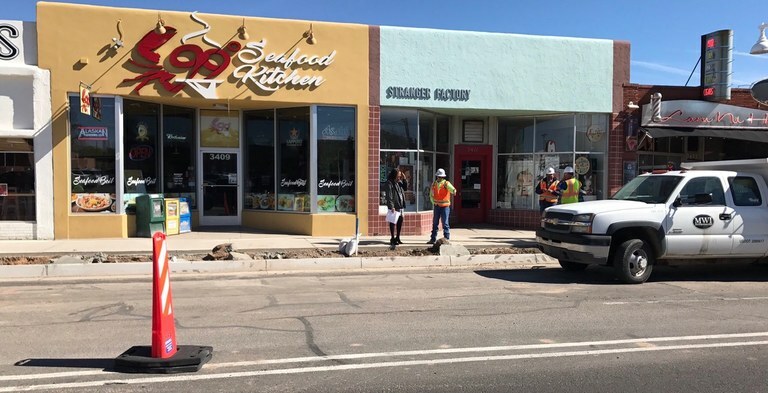 After weeks of work, on Monday we passed a bill freeing up funds for businesses in redevelopment areas along Central and that opened up existing funds for businesses in Nob Hill, UNM and EDO areas. The Small Business Resource Collaborative (SBRC) is an alliance of Albuquerque’s leading nonprofit small business development organizations, local business advocates, business consultants and small business owners. The purpose of the SBRC is to prepare independently-owned businesses who rely on walk-in traffic along the Central Avenue Corridor (Coors Blvd. to Louisiana Blvd.) for the Bus Rapid Transit construction. We are comprised of consultants with over 20 years experience working with businesses throughout Albuquerque. Our team provides customized on-the-ground support for business owners who don’t have time to attend trainings and events. We bring the resources to you! Contact us today to set up an appointment with one of us at www.sbrcabq.com. Need help from City Hall?